Area From 788.35 SQ.FT. – 3003.88 SQ.FT. 788.35 SQ.FT. – 3003.88 SQ.FT. 1 BR – 787.38 Sq. ft. – 984.79 Sq. ft.
2 BR – 1311. 58 Sq. ft. – 1778.95 Sq. ft.
3 BR – 1939.76 Sq. ft. – 2454.61 Sq. ft.
4 BR – 3003.88 Sq. ft. 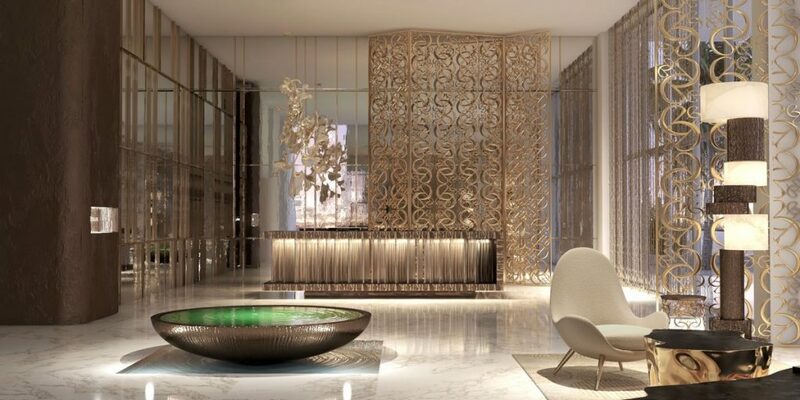 In a historic collaboration, giant property developer Emaar and world-renowned couturier Elie Saab unveil a lavish collection of luxury residences located at the picturesque Emaar Beachfront. The tower, which is the first ELIE SAAB designer building in the world, exudes a spirit of class and innate elegance in the heart of Dubai. 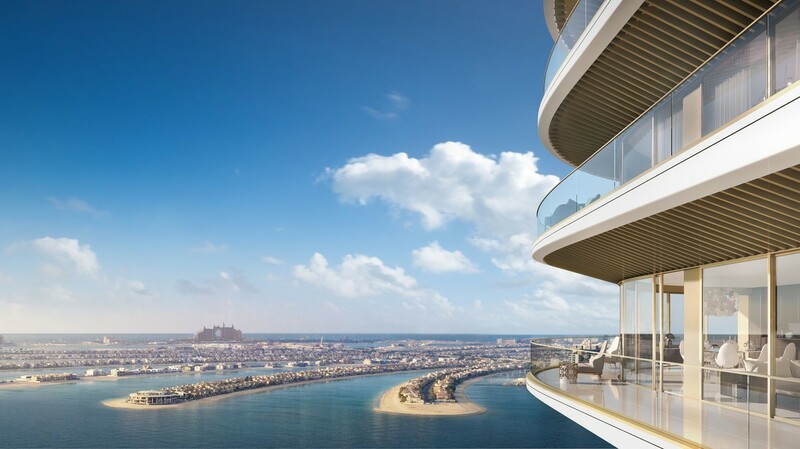 Featuring enchanting views of the iconic Palm Jumeirah and the blue horizons of the sky and the sea, ELIE SAAB by Emaar Beachfront serves as the paragon of contemporary opulence. Every element, from the tower’s mesmerising architecture to the lobby’s meticulous design, gives a new meaning to an upscale residential experience. Experience limitless possibilities and break the limits of possibilities at ELIE SAAB by Emaar Beachfront. One of the high-calibre personalities in the world of Haute Couture and a red carpet darling, Elie Saab takes inspiration from two major world cities—Paris and Beirut—where his ateliers are located. At the age of 18, he first unveiled his notable eponymous label with his Haute Couture line in Beirut, which was soon expanded into ready-to-wear and accessories. Each collection distinctly exudes innate femininity and elegance for which he made a name for himself in the industry. Today, ELIE SAAB is a valuable lifestyle brand, which accompanies women in every milestone in their life. It enjoys flagships and points of sale spread on a global scale, as well as wide-ranging product lines designed to cater to aficionados of ELIE SAAB aesthetics. 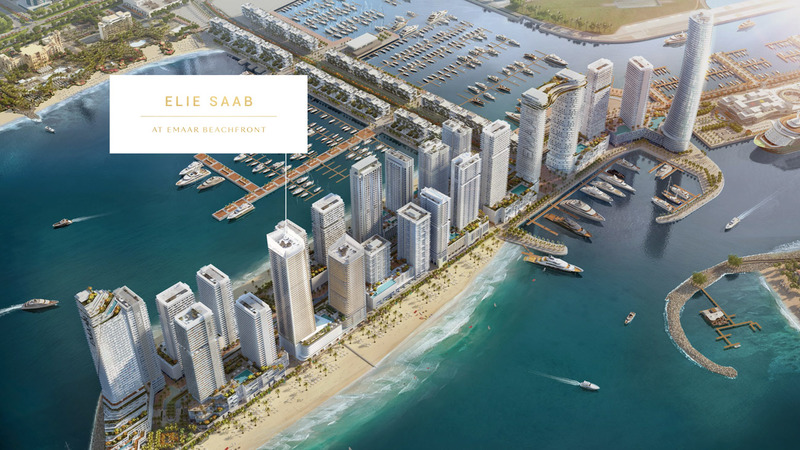 Beachfront Dubai Elie Saab boasts a combination of natural wonders and an exclusive residential community home to exquisitely designed towers located within Dubai Harbour, the new maritime centre of the UAE. This prestigious master-planned waterfront destination is where a luxury seaside lifestyle begins. The panoramic architecture is a fusion of Emaar’s design savoir-faire and ELIE SAAB’s haute couture prowess. It gracefully exudes Miami’s Art Deco District, a fabulous portion of South Beach characterised by glittering accents, graphic lines, and a lifestyle of pure indulgence. It also features a penthouse that offers an upscale sanctuary. Designed by Elie Saab himself, this tower offers an unparalleled residential experience with a touch of absolute sophistication, opulence, and quality. Moreover, bask in ultimate glamour in any of the grandiose collections of one to three-bedroom residences and the 4-bedroom penthouses featuring the highest specifications. Experience the spirit of absolute glamour and sophisticated living at Dubai’s most prestigious seaside residential destination. Here at ELIE SAAB by Emaar Beachfront, indulge in every moment of couture lifestyle with your family.